The “One” and only Jon Nees challenging Simon’s best shots! How can someone practice playing pickleball by themselves? Maybe playing against a wall will do it! Back in the old days we bounced the tennis ball or baseball against the garage door! That exercise would be shut down quickly by one of our parents. So usually the practice session was done until a couple of friends could be rounded up to practice or play, but that sometimes took hours or even days to arrange! “One” is a lonely number as the song tells us. Not on the pickleball courts of Robson Ranch AZ. The Pickleball Club has solved that problem! 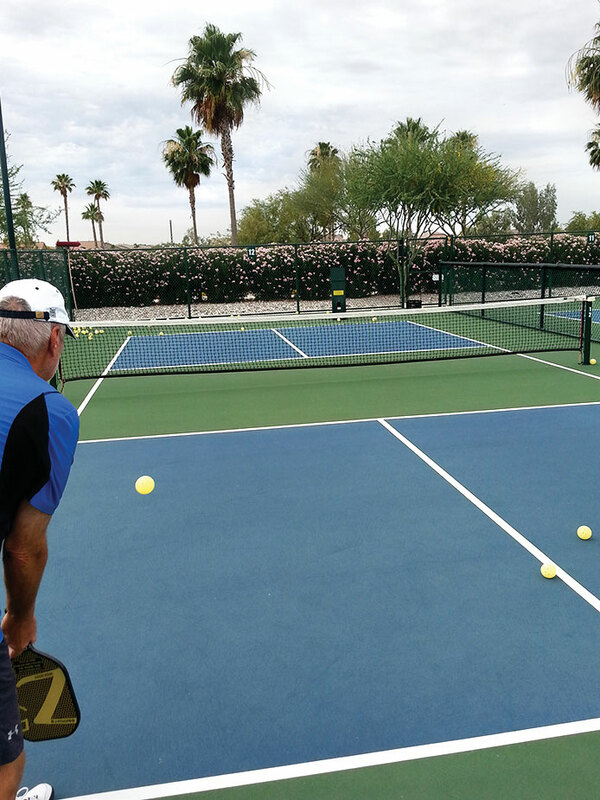 This last spring the club purchased Simon-The Pickleball Machine who (more correctly, which) is the perfect practice partner for a solitary player or even many players at a time. He (it) can be set up to practice almost any stroke that you desire to work on. Simon will provide practice for most shots be it volleys, ground strokes, third shot drop, third shot out of the kitchen, cross court dinks, straight across net dinks and overheads. It is completely portable and can operate from anywhere on the court. It is cordless and operates with rechargeable batteries to allow for its portability. Simon is small in size at 30 inches tall and 13 inches deep and wide. Aiding with its portability is the fact that it moves around on small wheels allowing easy positioning on different areas of the court. It has the ability to tilt, allowing height adjustments of desired shots. Shot speeds can reach up to 30 mph so quick shot returns or fast hand drills can be a part of the practice session also. If you are considering playing against Simon, some instruction on its use is required. Club members can learn how to operate Simon by contacting one of the Board members to set up an instruction session. Once you have learned the ins and outs of Simon, it can be checked out for your practice session by obtaining access to it at the Sports Club. So if drills to improve your game are in order, take advantage of Simon as a tool to drill yourself to an improved game. 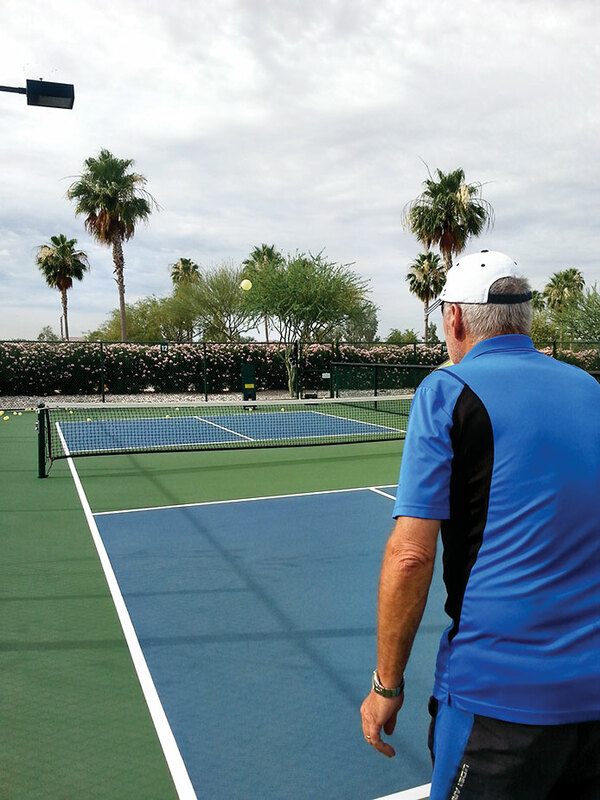 You can do it alone, but remember that pickleball still is a social game. Like any type of workout, having one or two or many friends makes the workout easier, more fun and more instructional as all can help each one. One is truly the loneliest number! Just ask Simon.